The above-cited model shows a variety of stages that one can expect to go through when modifying behavior. 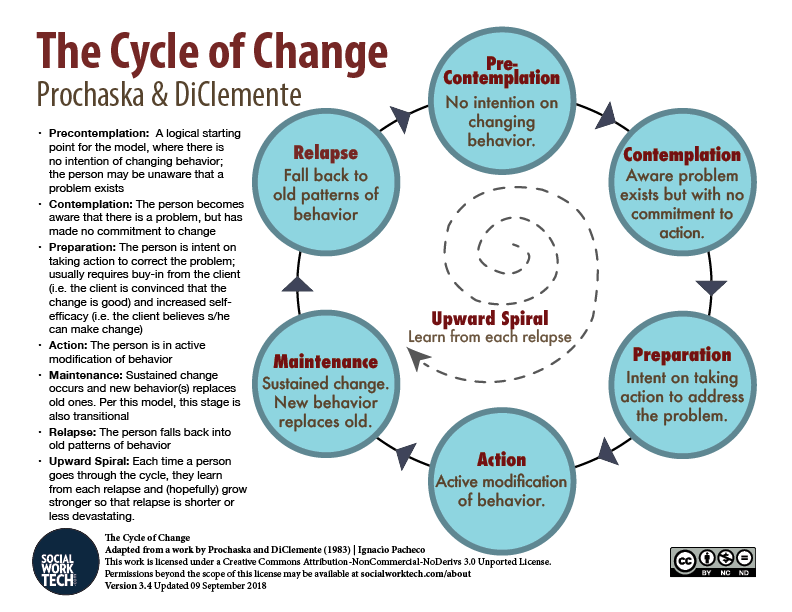 Whether it is you or your client, Prochaska & DiClemente’s model (1983) indicates that a person at any given time during this process is in a certain stage. Although the word “Relapse” may suggest that this model applies to drug/alcohol treatment, this model applies to all types of desired change, whether it is as trivial as ceasing to bite your fingernails or as serious as controlling one’s anger. 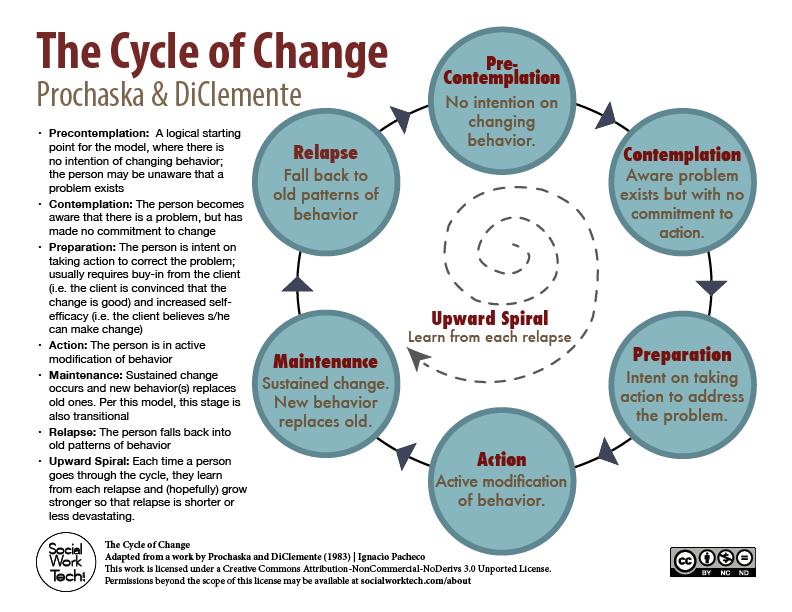 The model does not show an end to the process of change and suggests that a person is ever-progressing in the cycle. Logically, Relapse, or recurrence of previously undesired behaviors, would follow Maintenance of the newly acquired behaviors. It is possible for someone to stay years at the Maintenance stage or to never have a Relapse. When one Relapse, they may not be aware of it (i.e. Precontemplation) or may go through the Precontemplation phase quickly to being aware of the problem (i.e. Contemplation). Bonus Tip: It is hoped that in the stages of Preparation, Action, and Maintenance, that a person has developed resiliency, a support system and other coping mechanisms so that they can avoid the Relapse stage or get through it quickly. As previously stated there are different contexts in which this model can be applied. In Drug and Alcohol Recovery, this model is popular to help patients understand their pending journey or the journey they have made to the current point. In psychotherapy (and when clinically appropriate), I have shown the above model to clients I have counseled who have been discouraged about their failure or lack of progress in some of their desired changes. I show the client where s/he was prior to coming to therapy – sometimes at Precontemplation due to not having a direction at the start, at the Contemplation stage due to realizing that there is a problem, or at the Action stage due to wanting support on the action that they wish to embark upon. I will reflect on their Actions and reflect on the achievements that they have made to graduate to Maintenance. I congratulate them for making it to the Contemplation stage and being self-aware that they Relapsed. Empowerment comes from helping the client to reflect on what did not work in the Maintenence stage and helping them to correct that when taking Action. Again, I stress, building resiliency (including a support system and healthy coping mechanisms) is a very important task during the Action stage. You’ve given me a diving board to leap into a pool of uncertainty which has beset our school environment (rebuilding, personnel turnover and awe-inducing change). I have been contemplating the amplification of individual uncertainly to system scale in order to get my head around change management. Love the model. Pingback: Change: What stage are you at? And what's cycling got do with changing habits anyway?